Description: The Bluetooth Mate Gold is very similar to our BlueSMiRF modem, but it is designed specifically to be used with our Arduino Pros and LilyPad Arduinos. These modems work as a serial (RX/TX) pipe, and are a great wireless replacement for serial cables. Any serial stream from 2400 to 115200bps can be passed seamlessly from your computer to your target. We've tested these units successfully over open air at 350ft (106m)! Bluetooth Mate has the same pin out as the FTDI Basic, and is meant to plug directly into an Arduino Pro, Pro Mini, or LilyPad Mainboard. Because we've arranged the pins to do this, you cannot directly plug the Bluetooth Mate to an FTDI Basic board (you'll have to swap TX and RX). 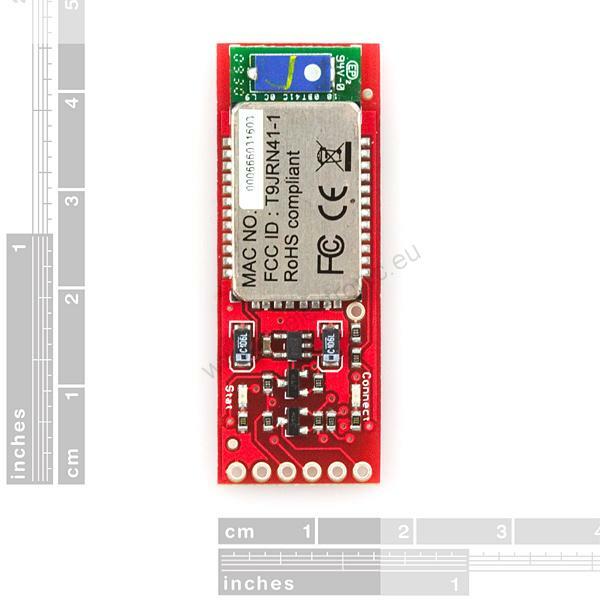 This unit ships with an RN-41 class 1 bluetooth module, a very easy-to-use and well documented bluetooth module. Make sure you check out the datasheet and command set links below. If you don't need the extra range, check out the Bluetooth Mate Silver which uses a Class 2 module which has less range. The Bluetooth Mate has on-board voltage regulators, so it can be powered from any 3.3 to 6VDC power supply. We've got level shifting all set up so the RX and TX pins on the remote unit are 3-6VDC tolerant. Do not attach this device directly to a serial port. You will need an RS232 to TTL converter circuit if you need to attach this to a computer. 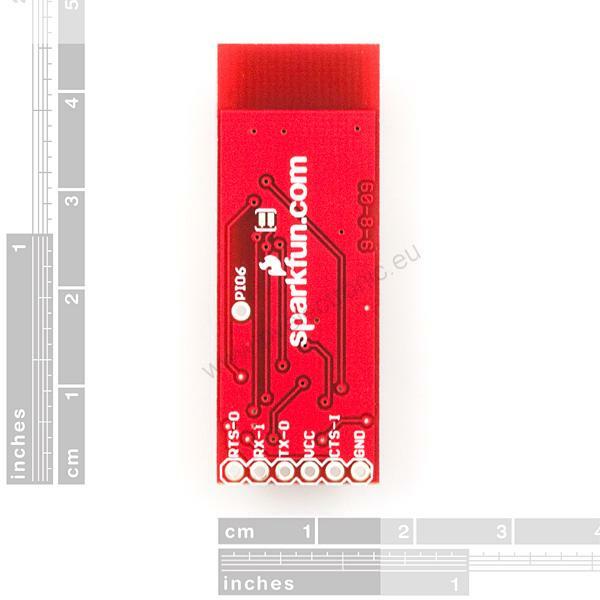 Unit comes without a connector; if you want to connect it to an Arduino Pro, we'd suggest the 6-pin right-angle female header. Note: The hardware reset pin of the RN-41 module is broken out on the bottom side of the board. This pin is mislabeled as 'PIO6', it is actually PIO4. Should you need to reset the Mate, pull this pin high upon power-up, and then toggle it 3 times. 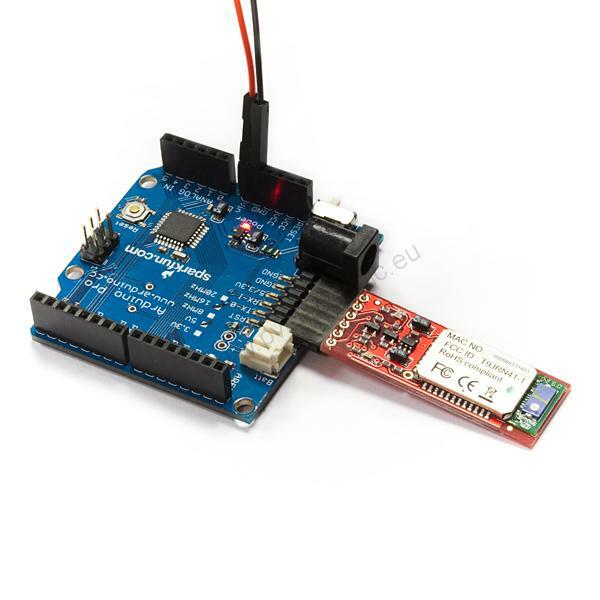 Features: • Designed to work directly with Arduino Pro's and LilyPad main boards • FCC Approved Class 1 Bluetooth® Radio Modem • Very robust link both in integrity and transmission distance (100m) - no more buffer overruns! 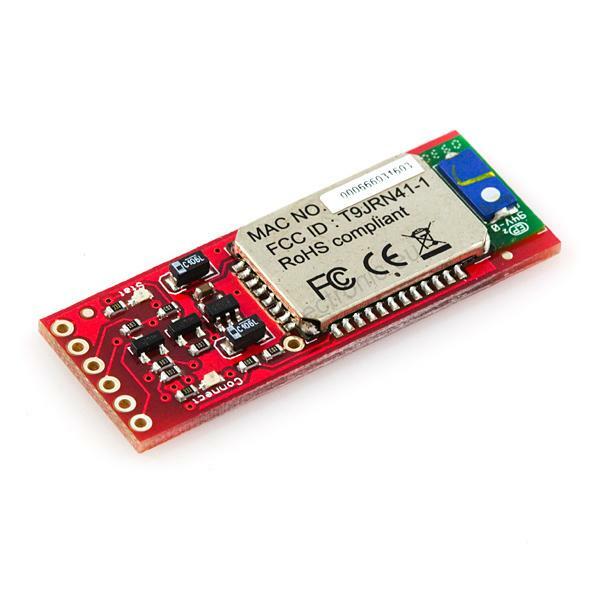 • Low power consumption : 25mA avg • Hardy frequency hopping scheme - operates in harsh RF environments like WiFi, 802.11g, and Zigbee • Encrypted connection • Frequency: 2.4~2.524 GHz • Operating Voltage: 3.3V-6V • Serial communications: 2400-115200bps • Operating Temperature: -40 ~ +70C • Built-in antenna Dimensions: 1.75x0.65"